I am a research scientist at a wildlife research institute. My job is to study wild cats to learn about their ecology so that we can recommend ways to help them survive. I work in Kingsville, Texas. 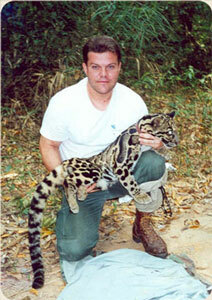 My research focus in Texas is on helping the endangered ocelot. I care about helping clouded leopards because they are such a unique and special species that deserves the right to exist in the wild for future generations. I worked as a volunteer on a bobcat reintroduction project in Georgia when I was 23. I learned how to trap and radio track bobcats. When I was young, I wrote a letter to Dr. George Schaller, who is a world-renowed wildlife researcher, and told him of my desire to study cats. He responded that if this is what I truly wanted to do that I needed to stay focused and finish my education up through a Ph.D. He was right, and I would offer the same advice to any person who wants to follow this path. Yes, as long as the will of the people and governments where clouded leopards range is strong. This can be assured by public awareness and research efforts. Wildlife conservation is a full-time job. Whether it be research, education or policy lobbying, the effort must always be put forth. By supporting organizations that support clouded leopard conservation such as The Clouded Leopard Project.